This year, the investing industry will hit a symbolic tipping point: The amount of assets in U.S. index funds is almost certain to surpass the amount in actively managed products for the first time. Meanwhile, Vanguard collected inflows of $218 billion in 2018, Bloomberg data show. The rest of the U.S. fund industry lost $237 billion. Technology played an underappreciated role. Index funds have to buy and sell hundreds of securities every day, to deal with investment flows, re-invest dividends and generally keep up with the index they’re meant to track. Vanguard’s first fund could only handle about half of the Standard & Poor’s 500 index. By 1992, computers and trading systems had advanced to the point where Vanguard could launch its Total Stock Market Index Fund, which is now a $672 billion behemoth that buys every single U.S. stock, 3,500 in all, for fees as low as 0.04 percent per year. The craze for indexes took on qualities that made Bogle unhappy. In his later years, when he was no longer in charge at Vanguard, he railed against exchange-traded funds, or ETFs, which are index products that can be bought and sold like stocks. He worried ETFs encouraged the sort of wasteful trading that hurt investor returns. 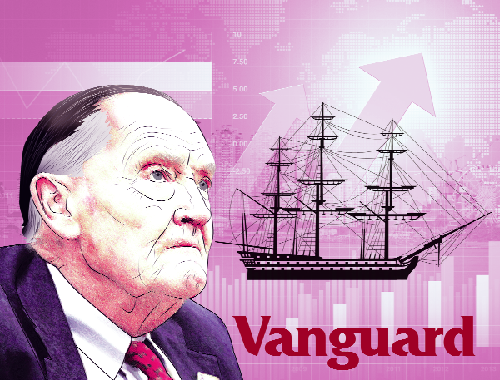 Few agreed with Bogle –- even at Vanguard, which offered its own ETFs –- and the funds now hold $3.5 trillion in assets in the U.S. The ultimate savings for the American investor from Bogle’s persistence may amount to more $1 trillion, according to an estimate by Bloomberg ETF analyst Eric Balchunas. And the windfall will continue to rise as the benefits of lower fees compound year after year after year.